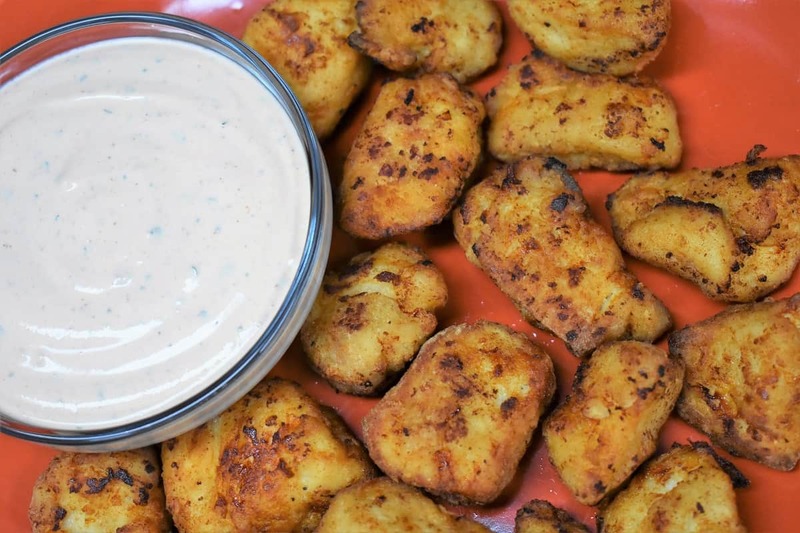 These chicken nuggets are served with an easy to make sriracha ranch dipping sauce. They’re great for the weekend served with some ice cold beverages, or for your next game-day spread. If you have any Sriracha junkies in your house, like I do, this is the perfect dish. 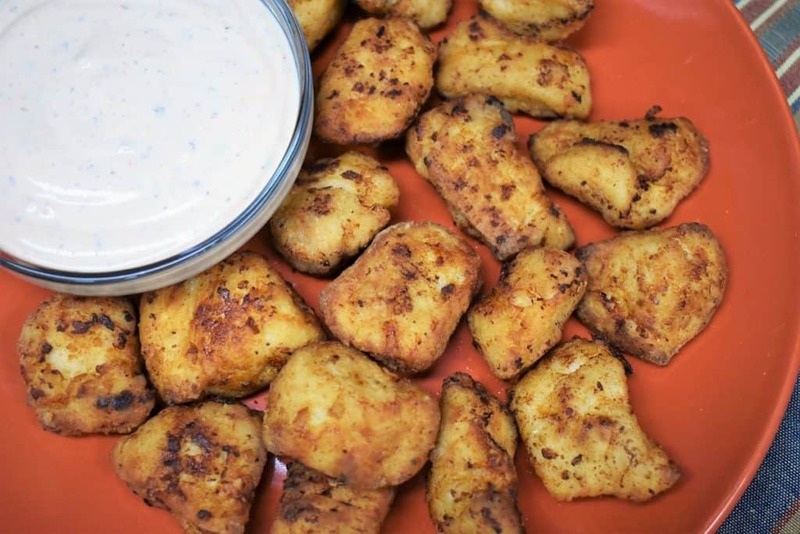 Juicy, delicious, homemade chicken nuggets are served with a creamy ranch dressing that is kicked up with spicy Sriracha sauce. My advice, serve everyone their own dipping cup because there will be double-dipping going on. If you want more appetizer ideas, check out these andouille sausage puffs that are a grown up version of pigs in a blanket. These baked beef empanadas that are sure to be a hit, or go with the classics with these loaded sheet pan nachos or these baked buffalo chicken wings. 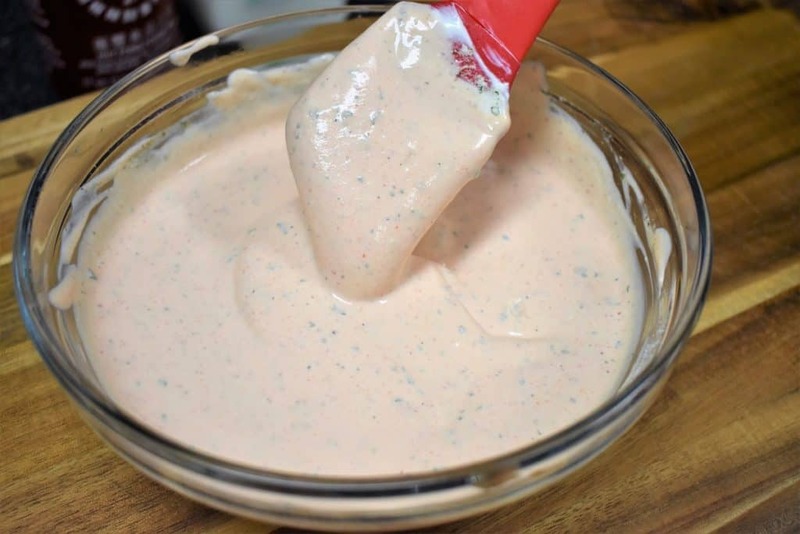 Make this spicy ranch sauce first, so the flavors get chance to know each other. Refrigerate, until ready to use. Just take the sauce out of the refrigerator a little while before serving to get the chill out. And give it a really good stir too. Add all the ingredients to a medium bowl. Stir with a rubber spatula or spoon until the ingredients are incorporated. We kept the sriracha ranch sauce mild, but if you have hot heads in your household, then by all means raise the heat factor by adding more sriracha. Now that the sauce is done, let’s make the chicken nuggets. We keep the seasoning and coating on the chicken really simple. They get a double coating of flour and are fried until golden. Cut each chicken breast into 1 – 1½ inch cubes. Try to make the chicken pieces roughly the same size so that they cook at the same rate. Add the salt, garlic powder, onion powder and black pepper to a small bowl and mix well to combine. Sprinkle the chicken with about half of the seasoning mix. Reserve the rest for the flour. Add the flour to a large pan or deep dish. Season the flour with the remaining seasoning and mix with a fork. Add the milk to a large bowl. 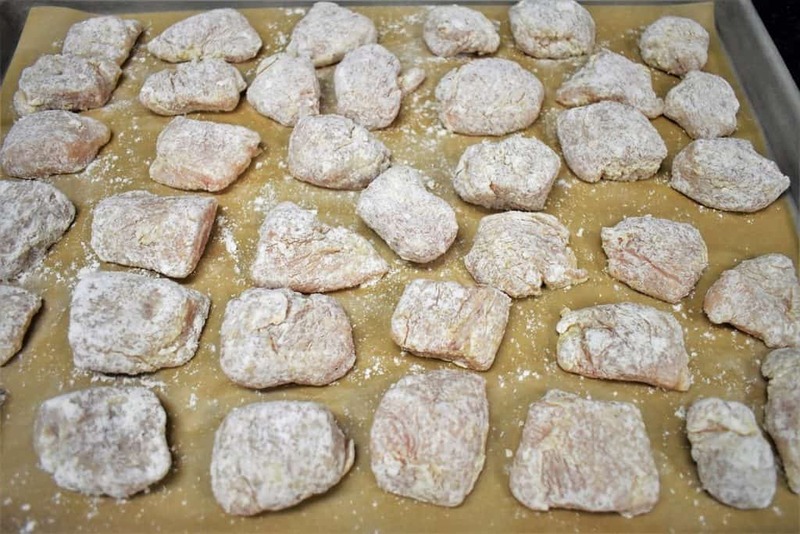 Working with a few pieces of chicken at a time, lightly coat it in the flour on all sides, shake off the excess flour. Next, dip the chicken in the milk; make sure it is evenly moist. 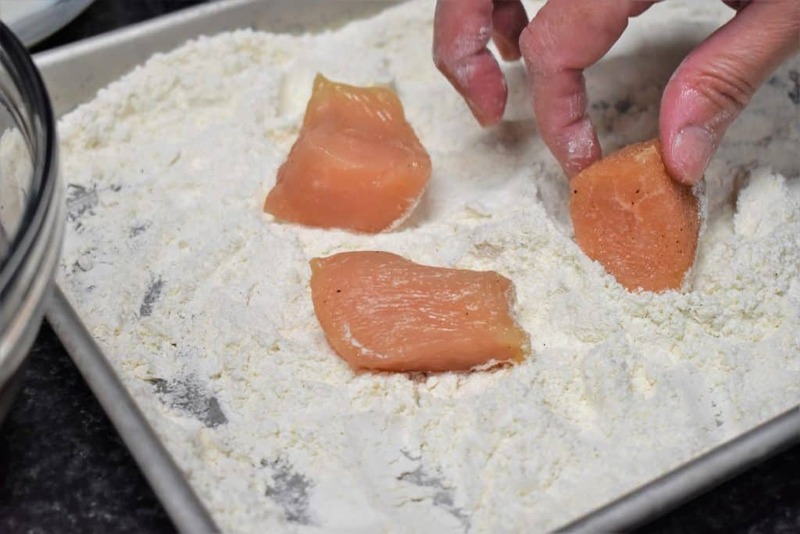 Now, place the chicken back in the flour, make sure there is an even coating and gently shake off the excess. Place the coated chicken on a pan or plate lined with parchment paper. Space the chicken so they’re not touching. Once the milk and the flour get together it creates pretty sticky stuff. The parchment paper will prevent the coated chicken from sticking to the pan. Repeat with the remaining pieces. Cover the bottom of a large, deep skillet with about a ½ inch of oil. The amount of oil to use will depend on the size of your skillet. Heat the oil over medium-high. When the oil is hot, but not smoking, add about half the chicken to the skillet (depending on the size). Don’t overcrowd the pan. Fry the chicken for a couple of minutes, turn each piece and continue frying for approximately 8 minutes. Turn the chicken nuggets a few times to make sure they get nice and golden on all sides. Turn them more often as they start to brown. 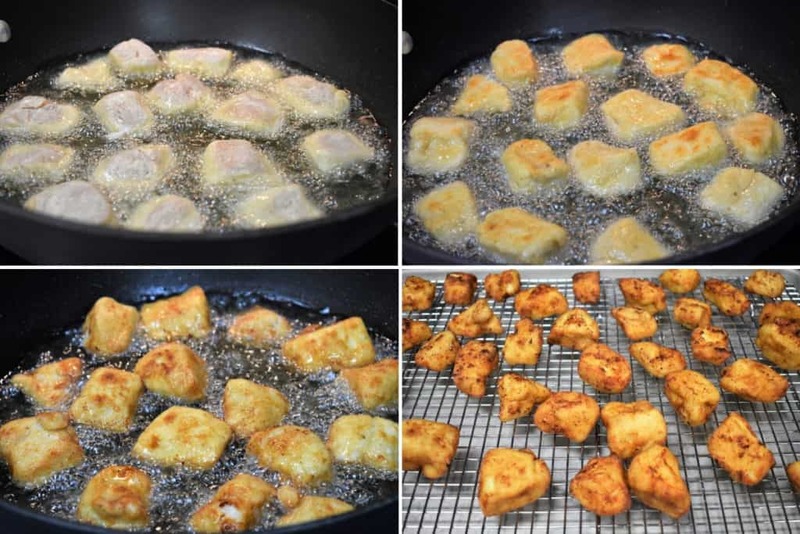 Remove the chicken nuggets from the skillet and place them on a baking sheet that’s lined with a cooling rack. The cooling rack will let air circulate and keep the bottom from getting soggy. Repeat with the remaining pieces of chicken. Take the temperature of a couple of the largest chicken nuggets and make sure they are at least 165°F. 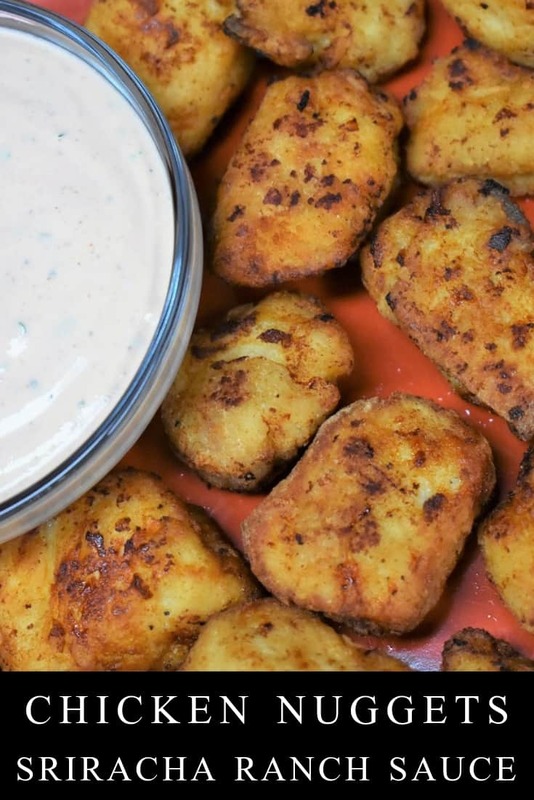 Serve the chicken nuggets with the Sriracha Ranch Dipping Sauce. What if my chicken is not cooked all the way through? Frying chicken can be a little tricky. If the oil is too hot, the outside will brown quickly and the inside may not be cooked all the way through. Chicken has to be at least 165°F at the thickest part. 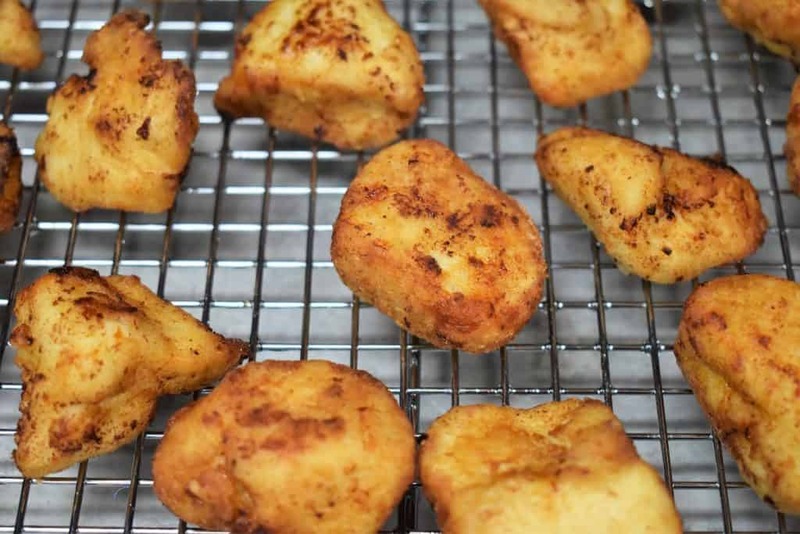 These chicken nuggets are boneless, chicken breasts and should cook quickly. But… things don’t always go exactly as planned, here’s a little fail-safe I’ve used in the past. 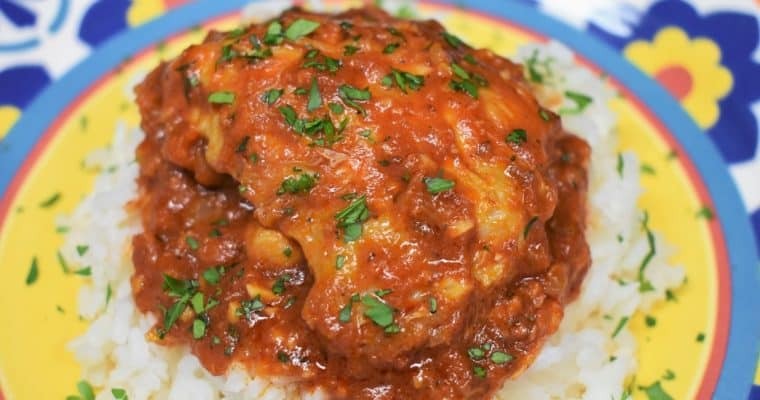 If you notice that the chicken is browning too quickly, and may not be up to temperature, preheat the oven to 350°F. When the chicken is the desired golden color place them on a baking sheet, that’s lined with a cooling rack. Place the baking sheet in a preheated oven for 10-15 minutes, take the temperature again. Repeat if necessary until the chicken reaches 165°F. 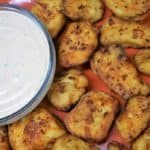 These chicken nuggets are served with an easy to make, and delicious sriracha ranch dipping sauce. They’re great for the weekend with some ice cold beverages, or for your game-day spread. Refrigerate, until ready to use. 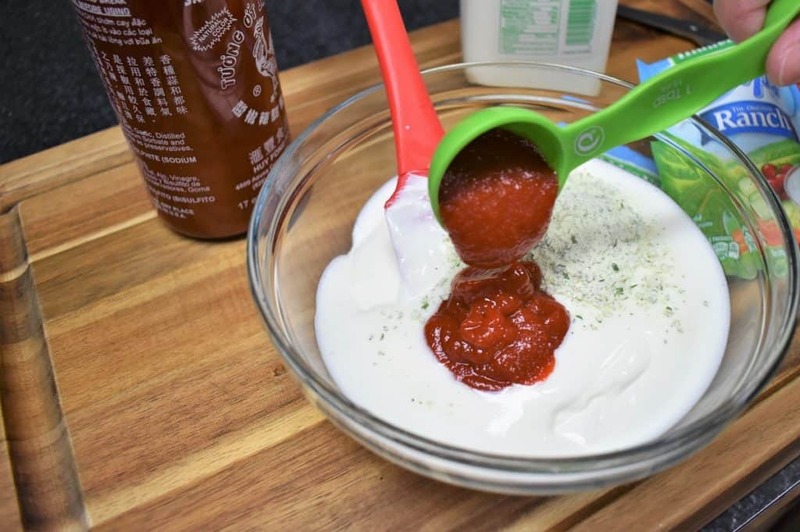 Take the sriracha ranch out of the refrigerator a little while before serving to get the chill out, and give it a really good stir. 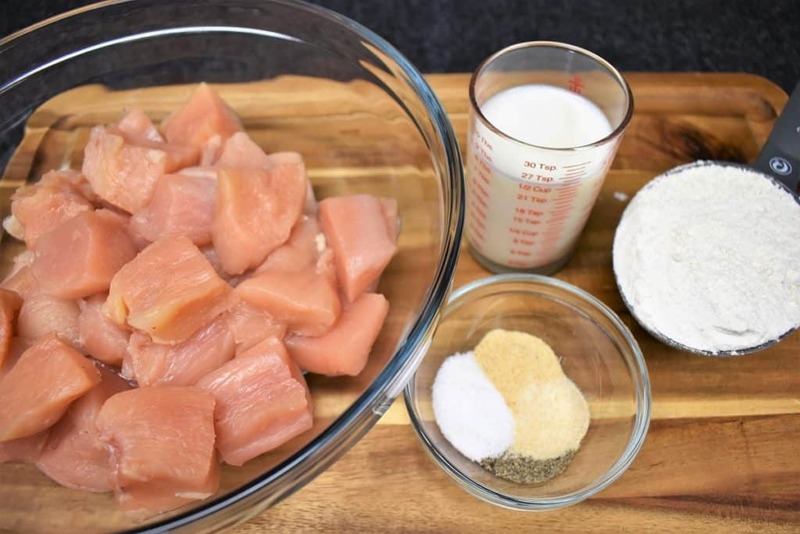 Cut each chicken breast into 1-1½ inch cubes. 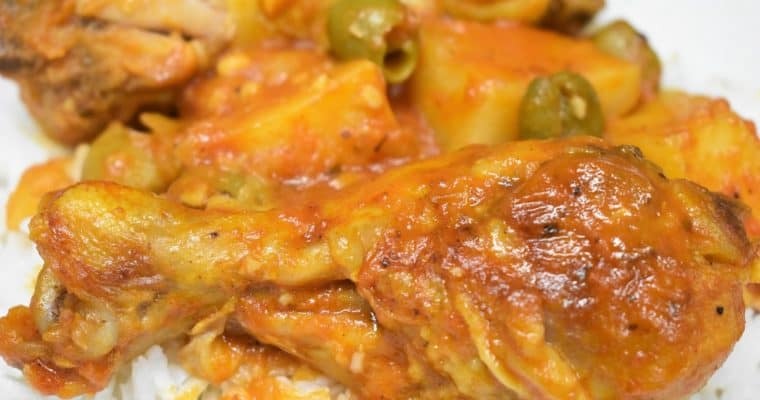 Try to make the chicken pieces roughly the same size so that they cook at the same rate. Sprinkle the chicken with about half of the seasoning mix. Reserve the rest for the flour. Add the flour to a large pan or deep dish. Season the flour with the remaining seasoning and mix with a fork. Add the milk to a large bowl. Place the chicken back in the flour, make sure there is an even coating and gently shake off the excess. Place the coated chicken on a pan or plate lined with parchment paper. Space the chicken so they’re not touching. The parchment paper will prevent the coated chicken from sticking to the pan. Heat the oil over medium-high. When the oil is hot, but not smoking, add about half the chicken to the skillet (depending on the size). Don’t overcrowd the pan. Fry the chicken for a couple of minutes, turn each piece and continue frying for approximately 8 minutes. Take the temperature of a couple of the largest chicken nuggets and make sure they are at least 165°F. Do you think theses could be cooked in air fryer? Hi Linda. Sorry, I don’t know. Never used an air fryer.